ADELPHI, MD. (December 17, 2018) – Creative geniuses behind digital humans and human-like characters in Hollywood blockbusters Avatar, Blade Runner 2049, Maleficent, Furious 7, The Jungle Book, Ready Player One and others have U.S. Army-funded technology to thank for visual effects. That technology was developed at the U.S. Army Institute for Creative Technologies at the University of Southern California. The ICT is funded by the U.S. Army RDECOM Research Laboratory, the Army’s corporate research laboratory (ARL). Developers of that technology were recently announced winners of one of nine scientific and technical achievements by the Academy of Motion Picture Arts and Sciences. A Technical Achievement Award will be presented at the Beverly Wilshire in Beverly Hills on February 9, 2019 to Paul Debevec, Tim Hawkins and Wan-Chun Ma for the invention of the Polarized Spherical Gradient Illumination facial appearance capture method, and to Xueming Yu for the design and engineering of the Light Stage X capture system during the Academy’s annual Scientific and Technical Awards Presentation. The Scientific and Technical Academy Awards demonstrate a proven record of contributing significant value to the process of making motion pictures. “Polarized Spherical Gradient Illumination was a breakthrough in facial capture technology allowing shape and reflectance capture of an actor’s face with sub-millimeter detail, enabling the faithful recreation of hero character faces. The Light Stage X structure was the foundation for all subsequent innovation and has been the keystone of the method’s evolution into a production system.” The new high-resolution facial scanning process uses a custom sphere of computer-controllable LED light sources to illuminate an actor’s face with special polarized gradient lighting patterns which allow digital cameras to digitize every detail of every facial expression at a resolution down to a tenth of a millimeter. The technology has been used by the visual effects industry to help create digital human and human-like characters in a number of movies and has scanned over one hundred actors including Tom Cruise, Angelina Jolie, Zoe Saldana, Hugh Jackman, Brad Pitt, and Dwayne Johnson at USC ICT. Additionally, the Light Stage technology assists the military in facilitating recordings for its Sexual Harassment/Assault Response and Prevention program through a system called The Digital Survivor of Sexual Assault (DS2A). DS2A leverages research technologies previous created for the Department of Defense under the direction of the U.S. Army Research Laboratory and allows for Soldiers to interact with a digital guest speaker and hear their stories. 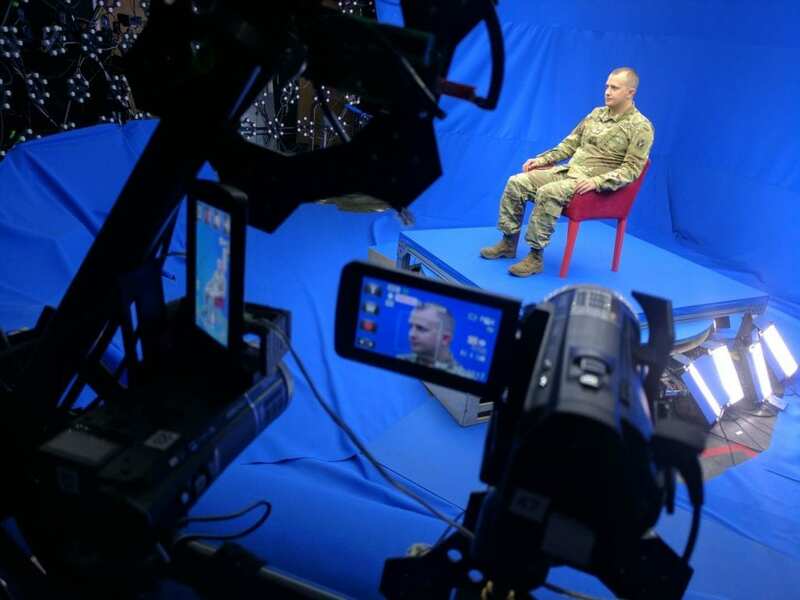 As part of the ongoing SHARP training, this technology enables new SHARP personnel, as well as selected Army leaders, to participate in conversations on SHARP topics through the lens of a survivor’s firsthand account. It is the first system of its kind to be used in an Army classroom. All four awardees were members of USC ICT’s Graphics Laboratory during the development of the technology from 2006 through 2016. Paul Debevec continues as an Adjunct Research Professor at USC Viterbi and at the USC ICT Vision & Graphics Lab. Wan-Chun “Alex” Ma was Paul Debevec’s first Ph.D student at USC ICT and Xueming Yu joined the USC ICT Graphics Lab in 2008 as a USC Viterbi Master’s student. Tim Hawkins now runs a commercial light stage scanning service in Burbank for OTOY, who licensed the light stage technology through USC Stevens in 2008. This is the second Academy Sci-Tech award being given to the Light Stage technology developed at the USC Institute for Creative Technologies. The first, given nine years ago, was for the earliest light stage capture devices and the “image-based facial rendering system developed for character relighting in motion pictures” and was awarded to Paul Debevec, Tim Hawkins, John Monos, and Mark Sagar. Established in 1999, the Army’s ICT is a DoD-sponsored University Affiliated Research Center (UARC) working in collaboration with the U.S. Army Research Laboratory. UARCs are aligned with prestigious institutions conducting research at the forefront of science and innovation. The ARL is part of the U.S. Army Research, Development and Engineering Command, or RDECOM, which has the mission to ensure decisive overmatch for unified land operations to empower the Army, the joint warfighter and our nation. RDECOM is a major subordinate command of the U.S. Army Materiel Command.